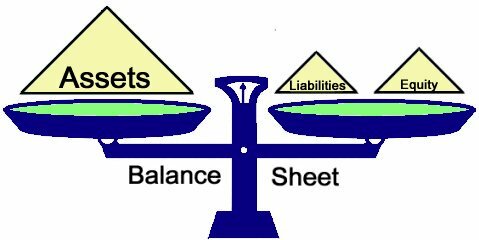 THE BALANCE SHEET is the financial statement that reports the assets, liabilities and net worth of a company at a specific point in time. Assets represent the total resources of a company, which may shrink or increase depending on the results of operations. Assets are listed in liquidity order - ease of converting into cash. Typical assets include: cash, accounts receivable, notes receivable, inventory, fixed assets and a number of miscellaneous assets classified as other. Liabilities include what a company owes: accounts and notes payable, bank loans, deferred credits and miscellaneous other. All businesses divide assets and liabilities into two groups: current (convertible to cash within a year) and noncurrent. Net worth is the owner's investment (in the case of a proprietorship or partnership) or capital stock (original investment) plus earned surplus (earnings retained in the business) in the case of a corporation. CURRENT ASSETS include cash, trade receivables and inventory. These are items that can be converted to cash within one year or in the normal operating cycle of a business. Also included in this category are any assets held that can be readily turned into cash with little effort, such as government and marketable securities. CASH refers to cash on hand or in banks, checking account balances, and other instruments such as checks or money orders. A rule of thumb is that cash position is generally strongest after the peak selling season. MARKETABLE SECURITIES are found on many balance sheets. Marketable securities can include government bonds and notes, commercial paper, and/or stock and bond investments in public corporations. Marketable securities are usually listed at cost or market price, whichever is lower. When marketable securities appear on a statement, it frequently indicates investment of excess cash. ACCOUNTS RECEIVABLE indicate sales made and billed to customers on credit terms. A retailer, such as a department store, may show its customer charge accounts billed and unpaid in this category. In many businesses, accounts receivable are frequently the largest item on the balance sheet. A company's health often depends upon timely collection of receivables. NOTES RECEIVABLE represent a variety of obligations with terms coming due within a year. Notes receivable may be used by a company to secure payments from past-due accounts, or for merchandise sold on installment terms. INVENTORY includes different items depending on whether a business is a manufacturer, wholesaler or retailer. Retailers and wholesalers will show goods that are sold "as is" with no further processing or supplies required in shipping. On the other hand, many manufacturers will show three different classes of inventory: raw materials, work-in-progress and finished goods. As a company's sales volume increases, larger inventories are required; however, problems can arise in financing their purchase unless turnover (number of times a year goods are bought and sold) is kept in balance with sales. A sales decline could be accompanied by a decrease in inventory in order to maintain a healthy condition. NONCURRENT ASSETS are items a business cannot easily turn into cash and are not consumed within the business cycle activity. Noncurrent assets are defined as assets that have a life exceeding a year. FIXED ASSETS are materials, goods, services and land used in the production of a company's goods. Examples include real estate, buildings, plant equipment, tools and machinery, furniture, fixtures, office or store equipment and transportation equipment. All of these would be used in producing products for a company's customers. Land, equipment or buildings not used in the production of customer goods would be listed as other noncurrent assets or investments. Fixed assets are carried on the company's accounting books at the price they cost at the time of purchase. All fixed assets, except for land, are regularly depreciated since they eventually wear out. DEPRECIATION is an accounting practice that reduces the fixed asset's carrying value on an annual basis. The reductions are considered a cost of doing business and are called depreciation expense. Normally, the accounting procedure is to list the fixed asset cost on the balance sheet less accumulated depreciation. Not all companies are comparable on this item as some rent their equipment and premises. If a company rents, its fixed asset total will be smaller compared with other balance sheet items. OTHER NONCURRENT ASSETS may include investments, advances to and receivable from subsidiaries, and receivables from officers and employees. INTANGIBLE ASSETS are those that may have great value to an operating company but limited value to creditors. Analysts tend to discount these items or value them very conservatively. Intangible assets include a company's goodwill, copyrights and trademarks, development costs, patents, mailing lists and catalogs, treasury stock, formulas and processes, organization costs and research and development costs. CURRENT LIABILITIES are obligations that a business must pay within a year. Generally they are obligations that are due by a specific date, usually within 30 to 90 days of fulfillment. To maintain a good reputation and successful operations, most businesses find they must have sufficient funds available to pay these obligations on time. ACCOUNTS PAYABLE represent merchandise or material requirements purchased on credit terms and not paid for by the balance sheet date. Most current liabilities of small companies generally fall into the accounts payable line. Suppliers dealing in good faith expect their invoices to be paid according to the terms of sale. These can range from net 30 to 60 days (after invoice date) plus discount incentives of 1 percent or more if payments are made by a specified earlier time. NOTES PAYABLE may include a company's borrowing from other firms and individuals. OTHER CURRENT LIABILITIES may include wages and salaries due employees for time between the last payday and balance sheet date, taxes due and payable and other expense incurred and unpaid at the time the balance sheet is prepared. LONG-TERM LIABILITIES are items that mature in excess of one year from the balance sheet date. Maturity dates (when payment is due) may run up to 20 or more years, e.g., a real estate mortgage. WORKING CAPITAL represents the funds available to finance current business operations. This figure is important as it is used to determine how much excess cash a business has to fund current expenses. Working capital is the difference between current assets and current liabilities. Since a company's sources to pay its current debt come partly from current assets, a business with a comfortable margin should be able to pay its bills and operate successfully. How much working capital is enough depends on the proportion of current assets to current liabilities rather than on the dollar amount of working capital. NET WORTH, OR EQUITY is the sum of all assets minus the liabilities, or total assets = total liabilities + owner's equity. Think of it this way: if everything a company owned was cash in the bank, and that cash amounted to $100,000, then total assets would equal $100,000. If the only liability the company has is one bill for $25,000, then total liabilities would equal $25,000. When the company pays the bill, it would have no liabilities and $75,000 left in the bank. The company would be worth (in financial statement terms) $75,000. Before payment, total assets ($100,000) = total liabilities ($25,000) plus net worth ($75,000). The Business Plan Store will prepare detailed financial statements for your business plan that express your vision in terms of dollars and units of time, and in a format that is easily understandable to people in the lending industries.